The traditional shepherd’s pie is prepared with minced beef and vegetables which then topped with mashed potato and baked. It’s also known as cottage pie and apparently it was a staple among the rural workers. I just wanted to replace the meat with other vegetarian protein, and I was contemplating between tofu and brown masoor lentils. 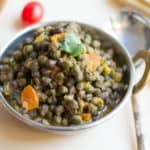 As I am still struck with my protein rich dals and lentils, I decided to use lentils for this recipe. I chose not to keep it vegan this time. So I used heavy cream generously while preparing my mashed potato and also topped the pie with cheese and panko before baking. I always prefer panko breadcrumbs. They are grainier than the regular breadcrumbs with no additional flavor. I love that flaky texture. But you can top it up with whatever breadcrumb you have in your pantry. PS: I did not include mashed potato preparation in this post. 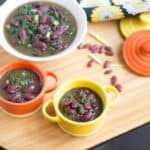 I just followed my recipe that I posted here. The only difference was I cooked my potatoes in the microwave to fasten the process. 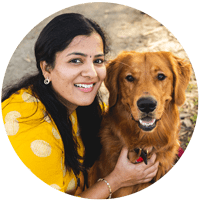 I have explained the make-ahead process and also how I prepared. I hope this helps. Overall this recipe took me about 1 hour and 40 minutes to cook from scratch including the mashed potato and cleaning. Without any further ado, here comes the vegetarian version of the shepherd’s pie. 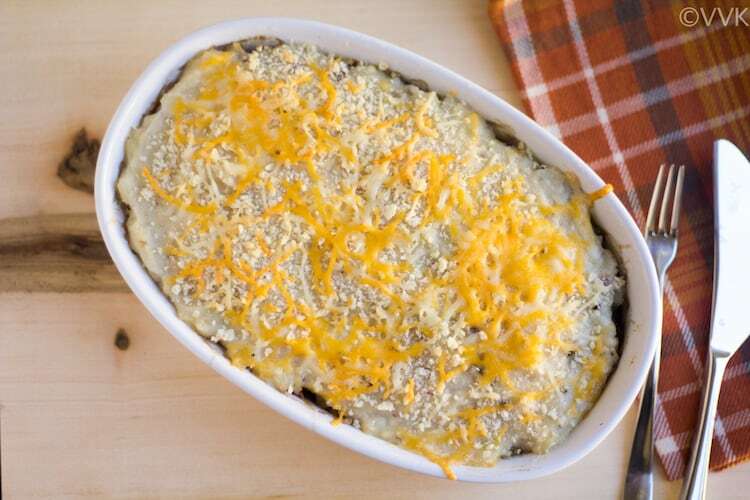 A classic casserole dish with combined goodness of lentils, vegetables, potatoes, and cheese. A perfect vegetarian main course meal. Prepare mashed potato as mentioned in this recipe and set aside 1.5 cups of mashed potato. You can prepare this well ahead and refrigerate. If using refrigerated one, make sure you bring it to room temperature and if it’s too thick/solid, reheat it by adding 2 to 3 tbsps of milk or cream. 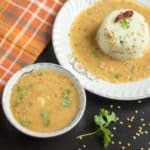 You can prepare the lentils in different ways. I always prefer the pressure cooker. But make sure you don’t overcook and make the lentils mushy. 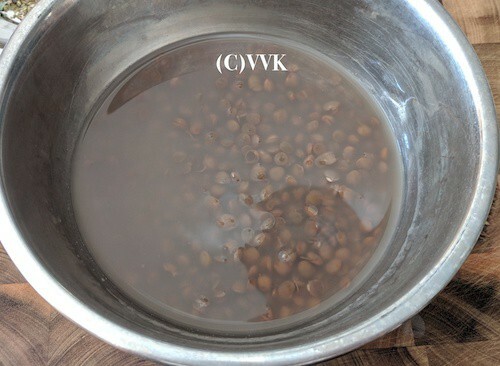 Wash the lentils and add 1 cup of water and pressure cook for just one whistle. Let the pressure release naturally and do not drain the water. You can cook the lentils ahead too. If you discard the water fret not, you can use veggie broth while preparing the vegetables. What I did: While the lentils were cooking, I prepared my mashed potato in parallel and chopped all the veggies. Chop all the vegetables including cilantro, onion, and garlic. Once the oil is hot add the onion and garlic and cook until they turn translucent and slightly browned up. Then add all the chopped veggies, followed by salt, pepper, dried thyme, basil, and oregano. Now add the cooked lentil along with the water. Mix well. Check for the seasoning at this stage. If required adjust as per your preference. 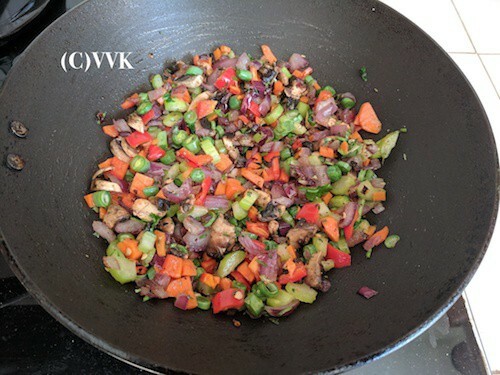 Let this veggie and lentil mix cook till 90% of lentil water is absorbed. The filling is now ready. Let it cool for 10 minutes before assembling. Again, you can prepare this mixture ahead. Once you have the stuffing and mashed potato available, you can put them together in the casserole dish, bake and serve when required. 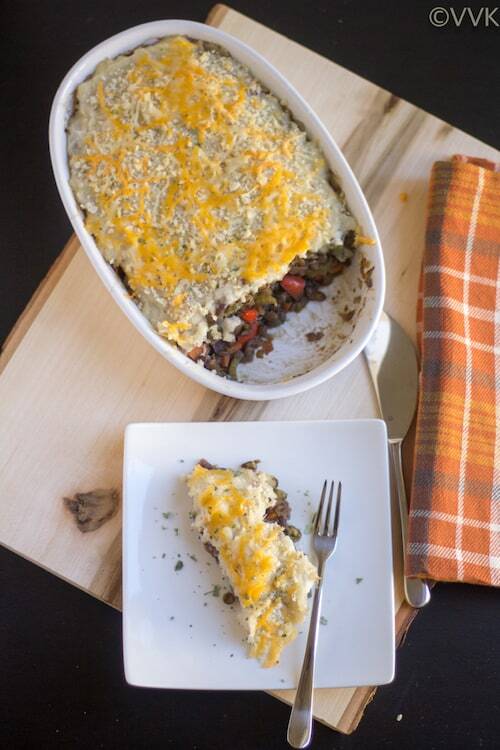 I used my CorningWare® French White® 15-oz Oval Casserole for this recipe. Preheat the oven to 350deg F.
Grease the casserole pan with one tsp of oil. Now add the vegetables and lentil filling and spread them evenly. Then add the 1.5 cups of mashed potato. Spread the mashed potato evenly on top of the vegetable filling. Sprinkle some panko bread crumbs then cheese on top. Bake this for about 8 to 10 minutes until the cheese melts. You can bake it up to 12 mts and let the potatoes brown slightly. But we like it this way. Let it cool a bit before serving. 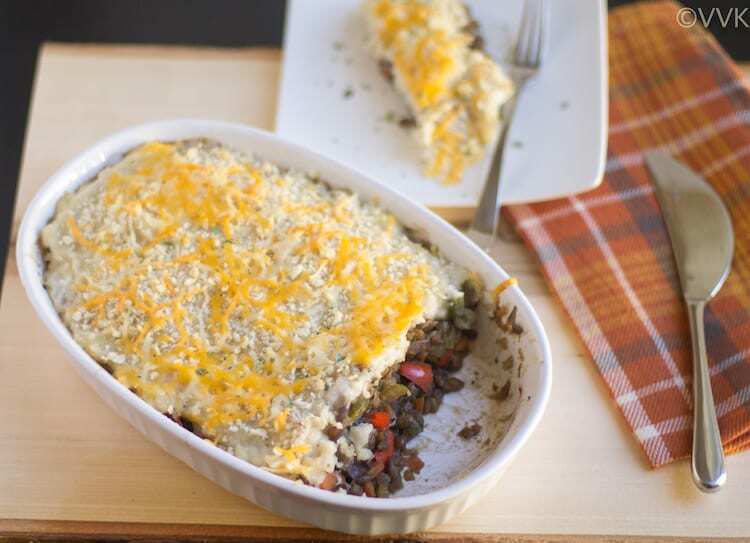 Enjoy the vegetarian shepherd’s pie warm. Instead of dried herbs, you can use fresh ones too. Adjust the quantity according to your preference. Also, it is not mandatory to use all three. In fact, I missed sage, which plays a major role in Thanksgiving meal. Depending on the cheese you add and the salt you added in mashed potato, adjust the amount you use for the filling. If you are using parmesan cheese, reduce the salt amount. You can use any of your favorite lentils and vegetables. If you have discarded the lentil water, use veggie broth for cooking the filling. Protein + vegetables + mashed potato = Shepherd’s pie. So you can have fun with ingredients and prepare it in your style. Then add all the chopped veggies, followed by salt, pepper, dried thyme, basil, and oregano. Mix them all. 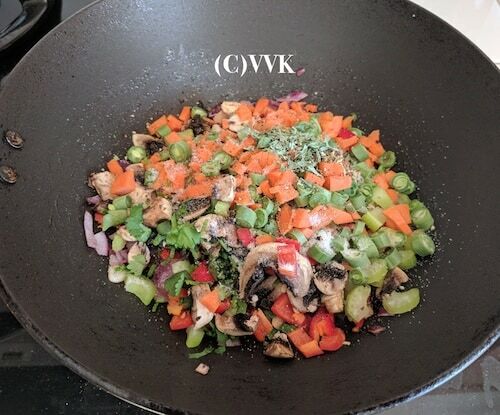 Such an innovative dish Vidhya.Looks and sounds delicious! Awesome. Been wanting to make this for ages. Bookmarking. Amazing pie! That’s a beautiful pie and the vegetarian version is making me bookmark it . One wholesome meal with all the goodness and beautifully presented . 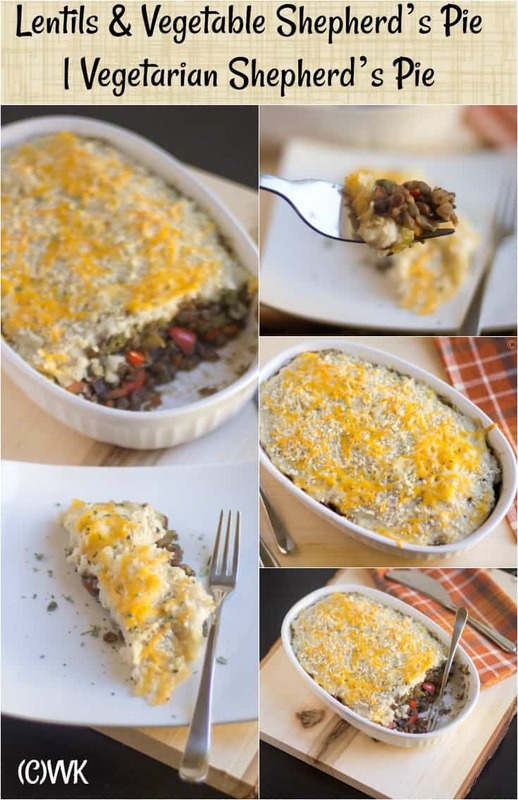 I have bookmarked various versions of vegetable shepherd pie but haven’t tried yet. This version looks just as appealing. Masoor dal in shepherd’s pie…love your vegetarian version of this classic. 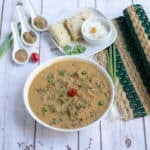 That is a great recipe and love that you have used the brown masoor dal. What a innovative dish this is and si awesome that you came up with a vegetarian version. 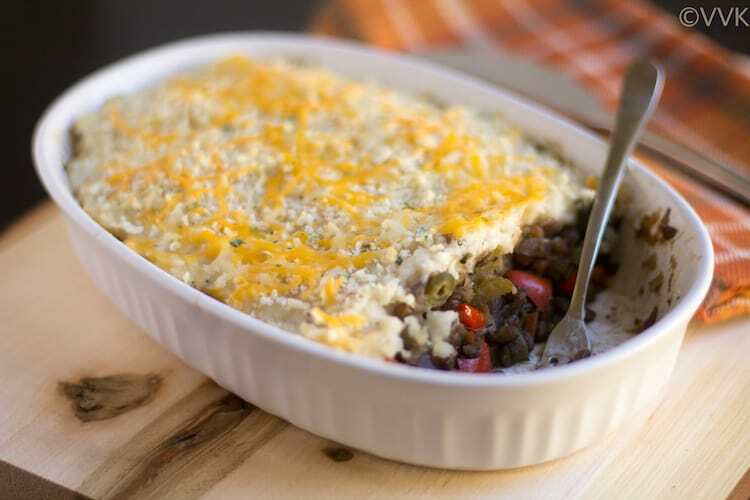 Shepherd’s pie is in my to do list since a long, and am looking for a chance to prepare some, and this lentils and vegetable version looks absolutely incredible and droolworthy. I’ve always wanted to try Sheperd’s pie but didn’t find a good recipe. 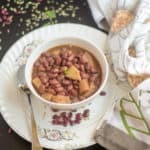 Your lentil recipe is tempting me to try it out some time soon. 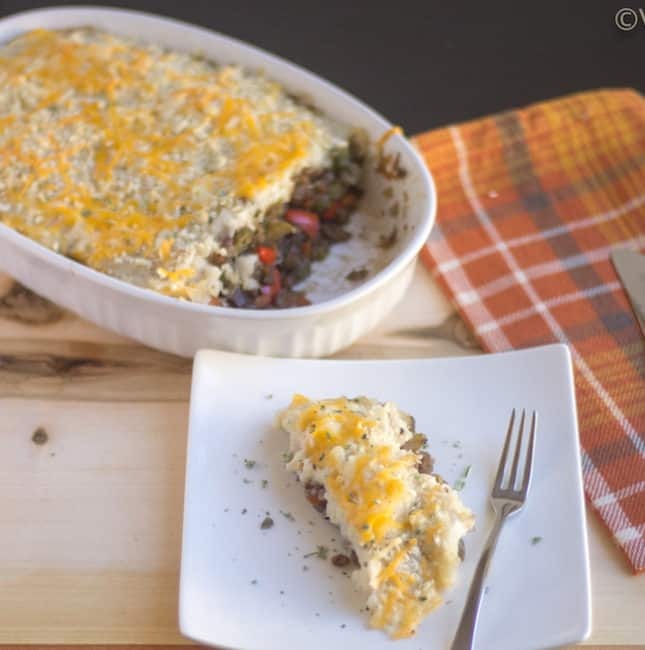 Vegetarian version of the Shepherd pie is irresistible. Lentils makes it more tempting.